Optic flow is a main source of information about self movement and the three-dimensional composition of the environment during locomotion. It is processed by the accessory optic system in all vertebrates. The optokinetic response is elicited by rotational optic flow, e.g. in a rotating drum lined with vertical stripes. We investigated here the effect of rotational optic flow on the optokinetic response in wild type and white zebra finches. The highest stimulus velocity eliciting an optokinetic response (upper velocity threshold) was dependent on stimulus direction and illumination level, but was not different between the colour morphs. 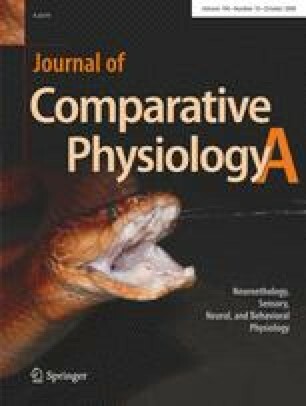 The upper velocity threshold was higher with temporal to nasal movements in monocularly exposed birds and symmetrical with binocular exposure. Its increase with illumination level followed Fechner’s law and reached a plateau at about 560 Lux. In bright daylight, white birds did not show optokinetic responses. We conclude that the altered wiring of the visual system of white birds has no influence on accessory optic system function. The unwillingness of white birds to respond with optokinetic response in bright daylight may be due to a substantial lack of inhibition within the visual system as demonstrated earlier, which may enhance the sensibility to glare.